It was a cookie baking extravaganza this past holiday season, and these beauties at the top of my list. They appeared to me through the StarTribune in this article. The bit of cayenne in these beauties truly sets them apart, I suggest not serving them with any other cookie or dessert – they need to stand alone in their uniqueness. Form into 1 1/2″ round log – or two logs. Wrap in wax or parchment paper and refrigerate a minimum of one hour. I baked mine a week later. These freeze well in this state too – just plop the log into a freezer bag. 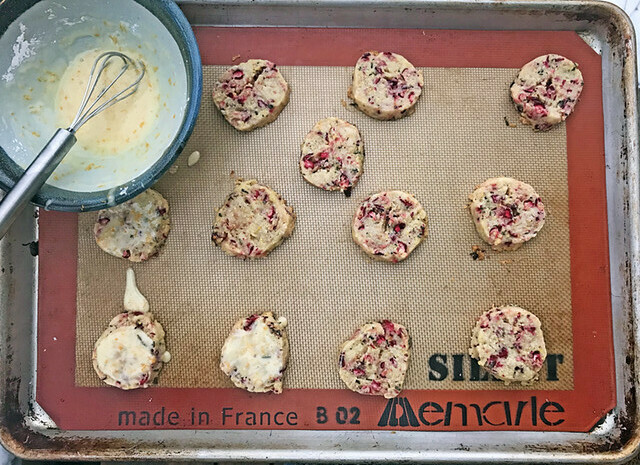 Slice into 1/4″ thick coins and bake at 325° for 20 minutes or until lightly brown. I love cranberry everything! Happy New Year – er, in February!